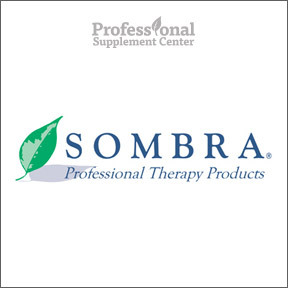 Professional Supplement Center now offers Sombra, a line of professional therapy products. Sombra was founded in 1974 with a mission to provide quality topical therapy solutions formulated with pure and natural eco-friendly ingredients and no unhealthy agents or solvents. Manufactured in the U.S.A. under strict quality control in their own facility, the Sombra Professional line of products is available solely through healthcare practitioners. Cool Therapy Gel – This quickly absorbed, natural pain relieving gel relieves minor muscle and joint pain associated with arthritis, simple backaches, strains, sprains and bruises. This quickly absorbed, natural lemon scented gel provides controlled cooling for acute conditions or injuries and is great for post-exercise cool down. Ingredients include 6% menthol along with aloe vera extract, yucca extract, grapefruit seed extract and rose water. No artificial colors, fragrances or alcohol. Also available in an easy to tote, convenient Cool Therapy Roll-on formula. Warm Therapy Pump – This fast-acting, botanical and natural ingredient formula provides safe and effective pain relief for chronic conditions such as neuropathy, bursitis, fibromyalgia, sciatica, arthritis and neck pain. Convenient 32 oz. pump container makes this non-greasy, quickly absorbed, refreshingly orange scented gel convenient and easy to use. Ingredients include 3% menthol and 3% camphor along with aloe vera extract, capsaicin and green tea extract. Also available Warm Therapy Gel and Warm Therapy Roll-On. See Sombra’s complete line here. This entry was posted in Home and tagged Arthritis, Cool Therapy Gel, Featured Brand - Sombra, Professional Supplement Center, simple backaches, sprains and bruises, strains, Vitamins and supplements, Warm Therapy Pump, www.professionalsupplementcenter.com. Bookmark the permalink.